As a member of Hockey Canada’s women’s team, Bailey Bram is in the midst of a rigorous Ice Hockey season with competitions every couple of days. Despite this busy schedule Bram still takes time out of her day to create mentorship videos for a group of students as part of her involvement with Classroom Champions. Bailey Bram is one of our 2017 Athletes in Excellence Award winners, and she was nominated by Classroom Champions. Growing up in the small town of Saint Anne in Manitoba, Canada, Bailey Bram began playing ice hockey when she was just four years old. As with many Canadian families, ice hockey was well loved and played by the Brams, with Bailey’s five brothers and her sister also playing. Bailey Bram: Diversity from Classroom Champions on Vimeo. While Bram was nominated for her work with Classroom Champions, she volunteers with several organizations. When she was playing with the Calgary Inferno ice hockey team, Bram and several of her teammates volunteered with the “Start the Spark” event through the Sheldon Kennedy Child Advocacy Centre. This event was collaborative effort to destigmatize mental illness in youth and to promote conversations among youth about their mindset. Bram is a terrific example of someone who uses sport as a way to reach young people. She is a mentor to young female hockey players through the Girls Hockey Calgary Association, and as part of this she guides a team with advice and leadership. At the Martha Billes Girls In Sport event at the Jumpstart Games, Bram was a recognized athlete mentor. Bram can also be found sharing her time with the Ronald McDonald House and Boys & Girls Clubs of Winnipeg. 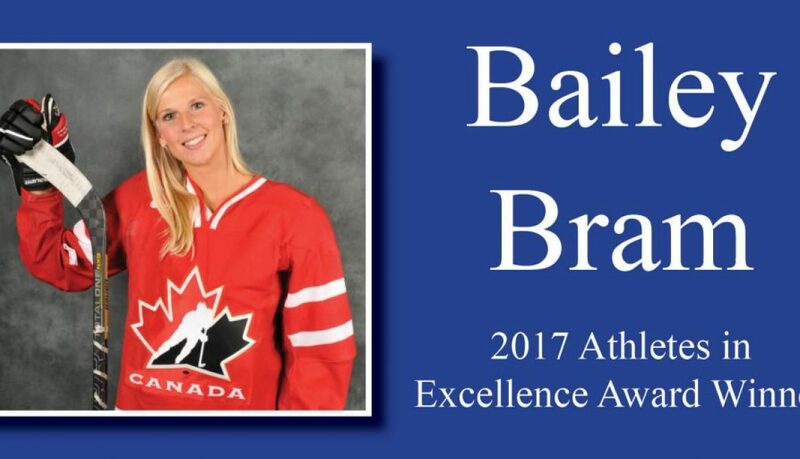 Bailey Bram has been a member of several outstanding ice hockey teams and has made an appearance at six different World Championships, including an Under-18 championship. In 2017 she and the rest of the Canadian won the Silver medal at the World Championships. They also won the silver medal in 2016, 2015, and 2013. In 2012 the team won the Gold medal. She was also a standout athlete in college and high school, making it to the 2013 Frozen Four NCAA tournament. She was on three College Hockey America conference tournament champion teams and four regular season champion teams. 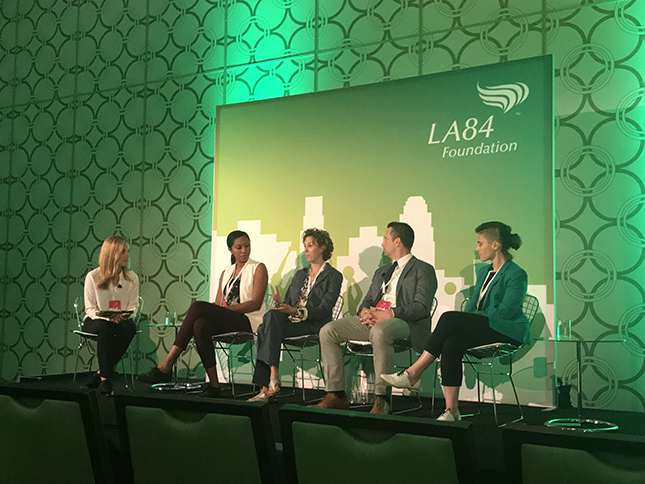 Last week we were delighted to support and attend the 6th Annual LA84 Foundation Youth Sports Summit in Los Angeles. This day-long event brought together close to 400 athletes, youth sports program directors, coaches, civic leaders, and other youth sports advocates for lively discussions and idea exchanges about the youth sports industry and play equity. Breakout Session panels covered recruiting more women to be coaches in youth sports, corporate brands impacting youth sports, and philanthropy among professional sport players. 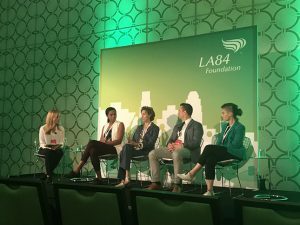 The morning began with a powerful message from LA84 Foundation President Renata Simril on the topic of play equity – that is equalizing the presence of organized and non-organized play and sport among youth of all genders, ages, abilities, and socioeconomic backgrounds. Her presentation was followed by a keynote speech from Janet Evans, the Director of Athlete Relations for LA2028. 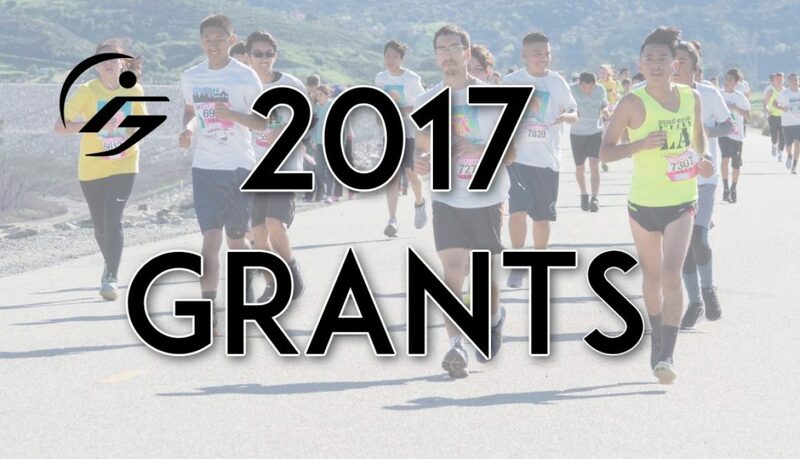 We were able to meet some of our Athletes in Excellence award winners, interact with leaders from some of our grant recipients, and enjoy a day all about youth sport! Our award-winning film, Munich ’72 and Beyond, is coming to the Los Angeles and New York City metro areas for a limited engagement. The documentary short Munich ’72 and Beyond will screen at Laemmle’s Music Hall in Los Angeles, November 3-9 at 12 Noon daily. Tickets may be purchased at Laemmle.com for $7, or $6 for seniors. The Music Hall is at 9036 Wilshire Blvd. in Beverly Hills. Additionally, we have partnered with the Malibu Film Society to feature a special one-night screening at the Malibu Jewish Center & Synagogue on Thursday, November 9 at 7:30 pm. Producer David Ulich will be in attendance for a Q&A after the film. This screening is free and open to the public, but advanced registration is required and may done at the Malibu Film Society’s website. The film will also be in New York City November 3-9 at the Cinema Village in Greenwich Village. Daily screenings are 12 Noon. Tickets may be purchased in advance at the Cinema Village website. “Munich ’72 and Beyond” won Best Documentary at the 2016 LA Shorts Fest and was nominated in the “Outstanding Research” category for the 38th Annual News & Documentary Emmy Awards. The film also is presented by The Foundation for Global Sports Development and Crisman Films, directed by Stephen Crisman and produced by Dr. Steven Ungerleider and David Ulich, with Executive Producer Michael Cascio. Learn more about the film at www.Munich72andBeyond.com.